Try it before you buy it!!!! FREEEEEE!!!!! 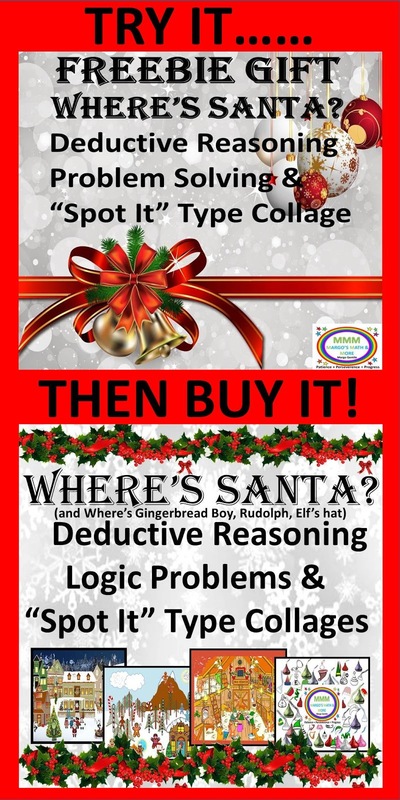 This is a sample that is similar to my larger product, "Where's Santa Deductive Reasoning Logic Problems & “Spot It” Type Collages (and Where’s Gingerbread Boy, Rudolph, Elf’s hat)"
The kids can have some fun while critically thinking with this task card/answer sheet activity. The first part of this activity involves finding, circling and numbering as many Santas as possible in the collage. Give students the top part of the directions/clues page to follow and record on. 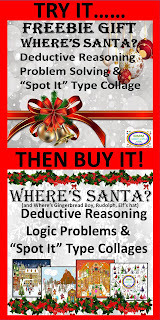 The second part of this activity is to find the real Santa by reading, using logic (deductive reasoning) and crossing out the Santas according to the clues given. The students must be given the bottom part of the directions/clues page to complete this and to record their answer about the “real” Santa.